Cargo lashing belt is an indispensable tool in lifting operations. Today, more and more heavy duty ratchet straps are used to lift large objects, so the safety requirements of cargo lashing belt are more stringent. Coupled with the large size of objects, lifting is difficult and high risk. How to make sure safe and secure to lifting large objects? This is worth discussing. 1. First to observe the basic situation of objects, to determine the exact weight and the center position. 2. Select the appropriate cargo lashing belt according to the basic situation of the object, especially the capability of the cargo lashing belt. Overload is not allowed. 3. Some objects are designed with lifting rings, we can take advantage of this or to find correct lifting position by yourself. 4. 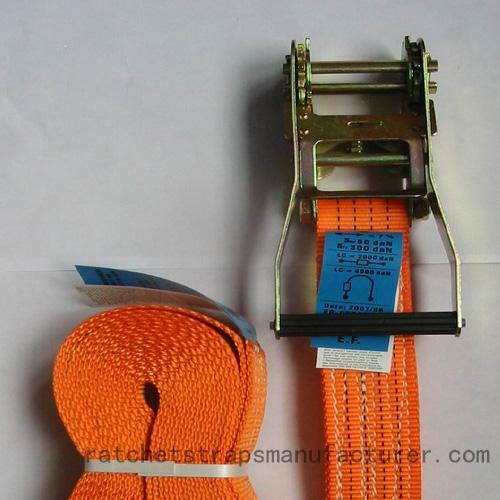 If the object has sharp edges or angles, protection should be done for cargo lashing belt to prevent cutting accident. Master the above skills, lifting large objects will become easy and safe. Here, keep in mind that have a trial before lifting to make sure there is no problem. It will be safe to choose right loads on the basic conditions of the object and pay attention to operating specifications.